And it's below average for a U.S. Olympic team. Should we worry? 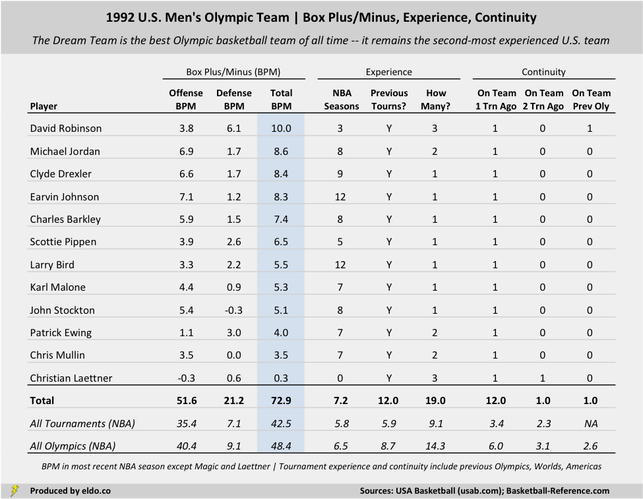 For those interested, here's a closer look at the 1992 Dream Team, 2004 Bronze Medal Team, and 2016 U.S. Men's Olympic Basketball team. Were you to remove the "bottom six" players on the 2016 team and replace them with Stephen Curry, Russell Westbrook, LeBron James, Kawhi Leonard, Chris Paul, and James Harden, the 2016 team would have a higher cumulative Box Plus/Minus (BPM) than the Dream Team. These teams are, of course, not selected according to BPM -- and to be fair, the Dream Team could have made some BPM improvements too. The point is that the 2016 team could be a lot better than it is. That's the unsettling part. As we've seen and stated repeatedly, the 2016 U.S. men's Olympic basketball is not as bad or inexperienced as the dreadful 2004 team that went 5-3 in Athens. But international competition improves, anything can happen in a single game, and it's not so hard to look at that 2016 roster (scroll down) and wonder whether in a few weeks we're all going to be saying, wow, the U.S. marched out some of those guys instead of Curry, Westbrook, James, Leonard, Paul, or Harden -- just as we look at 2004 today and say, wow, the U.S. started Marbury, Iverson, Marion, and Odom while Kidd, Bryant, McGrady, Garnett, and Shaq were all watching at home. In other words, there's enough of a hint of 2004 on the 2016 roster -- top players sitting out, questionable fit for some players with the international game, maybe a questionable locker room guy or two -- to conjure up some worry. It might be one loss worth of worry rather than three, but if it comes in the knockout round it will be enough to send USA basketball into "what went wrong" mode and will probably result in some sort of Redeem Team II in 2020 that tries to right the wrongs of 2016. Close games are fun, but here's hoping that need not be the case. ﻿The data sources for this article are USA Basketball (usab.com) and basketball-reference.com. Data was compiled and analyzed by ELDORADO. All charts and graphics herein were created by ELDORADO.